Deal Offers Hope To Families Of Americans Imprisoned, Missing In Iran : The Two-Way Those detained include a former Marine, a pastor and a Washington Post reporter. The missing man is a former FBI agent. The U.S. says Iran should "make a humanitarian gesture and bring" them home. 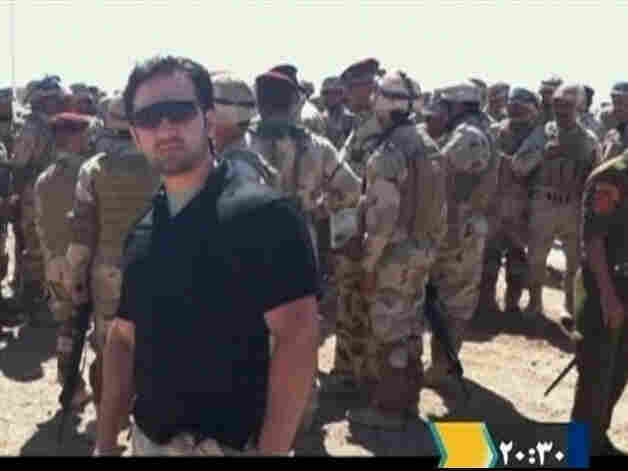 Amir Hekmati, in an undated still image taken from video in an undisclosed location made available to Reuters TV on Jan. 9, 2012. Iran sentenced the former Marine to death in 2012 on charges that he was working for the CIA. Hekmati's family has insisted he was in Iran to visit family when he was arrested in 2011. The death sentence was later annulled, and Hekmati, the Arizona-born son of Iranian immigrants to the U.S., was sentenced to 10 years' imprisonment in a subsequent trial. "Amir is an innocent man who traveled to Iran to visit family, yet there is no denying that his imprisonment has been prolonged pending an outcome in these negotiations. While Amir himself has said that he should not be part of any nuclear deal, his immediate release would demonstrate a strong gesture of good faith to the international community following the successful end of the negotiations and enhance any agreement's prospects in the U.S. Congress. "This August will mark four years that Amir has languished behind the walls of Evin prison. We pray Amir does not reach this milestone. It is long past time that Amir be released to end his and our family's suffering." 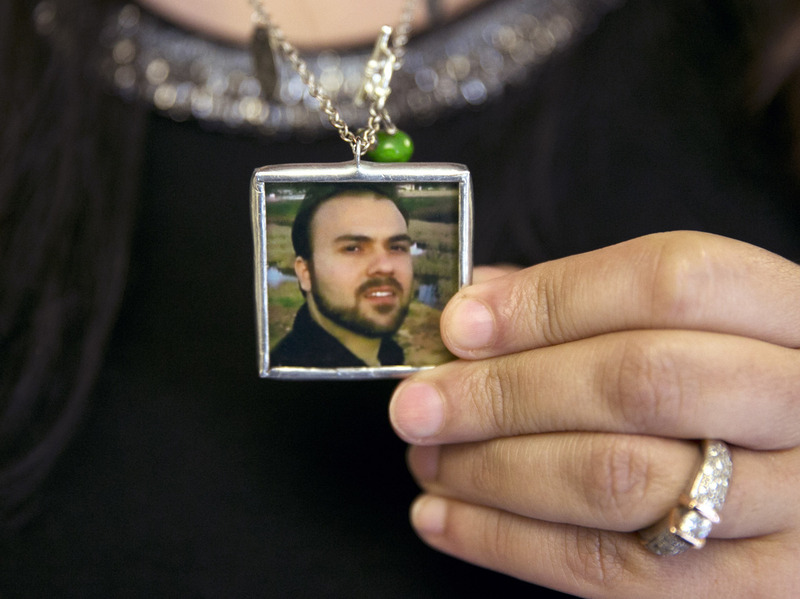 Naghmeh Abedini holds a necklace with a photograph of her husband, Saeed Abedini, on June 2. Abedini, who converted to Christianity 15 years ago, was detained in Iran in 2012 and sentenced to eight years in prison on charges of disturbing national security. He was in the country to build an orphanage. His wife, Naghmeh Abedini, told Congress recently that Abedini, a pastor, had been told he cannot leave unless he renounces his faith. "I plead with Congress to ensure that my husband, an American citizen, is not left behind," said Naghmeh. "With the announcement of a deal and yet silence as to the fate of Saeed and the other Americans held hostage in Iran, their fate lies now in the hands of Congress. I plead with each member of Congress to review the deal with our family at the forefront of their thoughts. Congress holds the key to bringing my husband home, to returning the father to my children. My children have desperately missed the loving embrace of their father for the last three years of their lives. They have grown up almost half of their lives without their father. Please help us ensure the remainder of their childhood includes both a mother and a father." Jason Rezaian, Tehran correspondent for The Washington Post, is seen April 11, 2013. The Washington Post reporter was arrested in July 2014 on charges of spying on Iran for the U.S. Rezaian is the newspaper's Tehran correspondent and had been covering the nuclear talks in Vienna. His trial began in May, and Rezian faced his third court hearing on Monday. "The outcome of the nuclear deal does not change Jason's cruel and illegal imprisonment for the past 356 days. Jason is completely innocent of all charges and it is inhumane for him to still be held behind bars after nearly a year. He was a journalist doing his job and today he should be reporting on the details of this agreement rather than being subjected to continued incarceration and delays in the judicial proceedings. "We remain appreciative of the ongoing efforts of the U.S. Government behalf of Jason and the other Americans being held in Iran. "We are hopeful that with agreement now in place the Iranian courts will conclude this process swiftly and affirm Jason's innocence so we can bring him home and make our family whole once again." 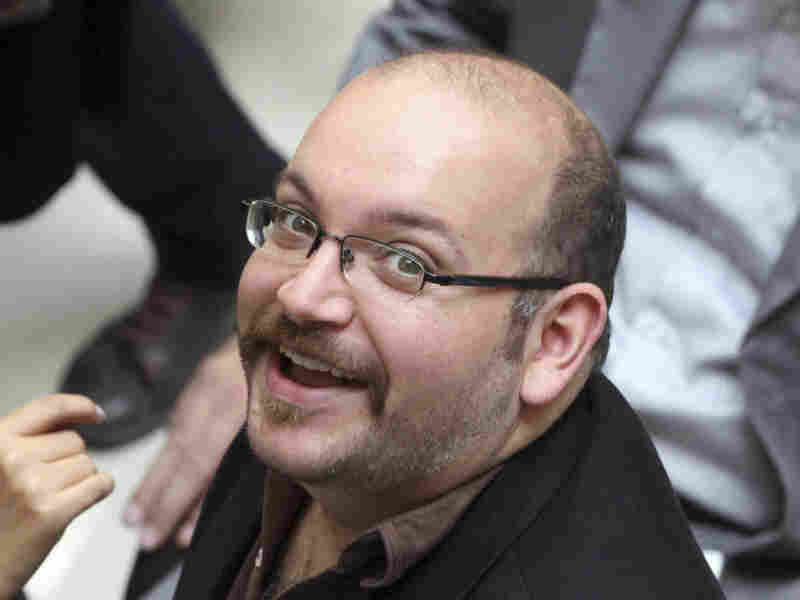 "It is important to remember that Jason Rezaian, The Washington Post's Tehran correspondent, remains in an Iranian prison despite the international accord announced Tuesday on Iran's nuclear program. His unjust detention on espionage and other charges trumped up by the Iranian authorities has now lasted nearly a full year. We call again on Iran to deliver a fair and impartial judgment in Jason's case, one that could only result in his acquittal and immediate release. We hope that with the deal now in place the Iranian courts will move swiftly to conclude this process and allow Jason to return to his family." An FBI poster showing a composite image of former FBI agent Robert Levinson. The retired FBI agent disappeared in Iran in 2007 after traveling to the island of Kish, a resort The Associated Press described as "awash with tourists, smugglers and organized crime figures." 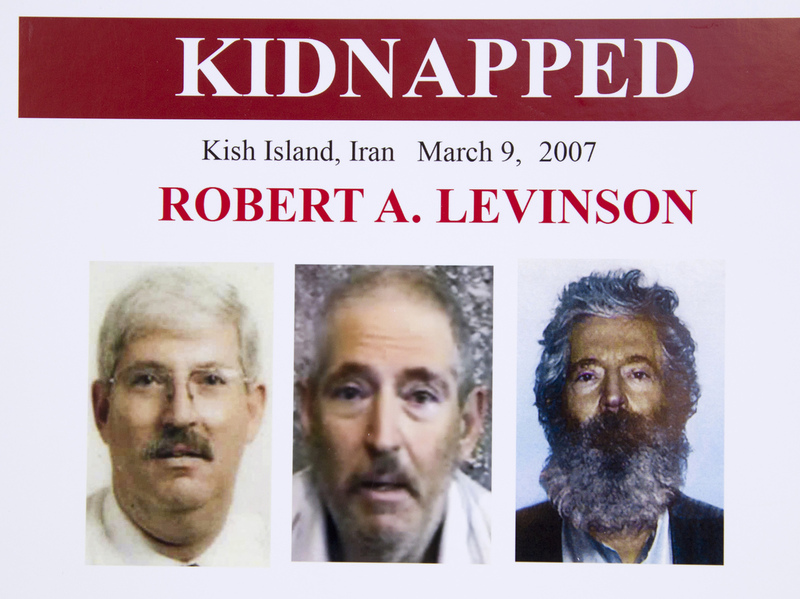 The U.S. has publicly described Levinson "as a private citizen who traveled to the tiny Persian Gulf island on private business." He was last seen in a video the family received in November 2010 and that was made public a year later. In it, he says: "I have been treated well. But I need the help of the United States government to answer the requests of the group that has held me for 3 1/2 years." As we reported at the time, the family since receiving the tape has received photos of Levinson dressed in an orange prison jumpsuit like the ones worn by detainees at the U.S. military prison at Guantanamo Bay, Cuba. The Associated Press has reported that Levinson may be being held in Iran, Afghanistan or Pakistan. "The governments of the United States and Iran have worked together to reach this agreement. They need to continue working together with the same sense of urgency to resolve Bob's case and return him home to his family as soon as possible. Bob has been held against his will for more than 8 years. This nightmare must end." A senior Obama administration official, when asked about Levinson and the detained Americans, said U.S. Secretary of State John Kerry and others have had more than one conversation about the four men during this negotiating round. "We think that this is a moment where Iran has a really important opportunity to make a humanitarian gesture and bring the Americans home," the senior administration official said.